Searching for a home within the Union Park Elementary School Zone? Then you are in the right place! We work hard to make your next home search easy and efficient, so that when you are ready to buy or sell, we are ready to help! 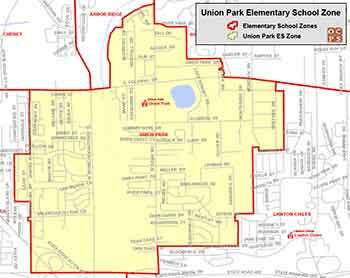 Students of Union Park Elementary reside within the 32817 and 32825 zip codes. Union Park Elementary School was established in 1919 on property along State Road 50 near Dean Road. It was a small school of wooden construction serving a very rural community. In 1936, the school moved to the site on which Union Park Middle School is currently located. Eight new classrooms were constructed just south of State Road 50 on Dean Road in 1955. The expansion housed grades one through three, while grades three through six remained at the old site. Union Park Elementary School was completely moved to the current site at 1600 North Dean Road in 1962. As the Union Park area grew in population, the school had need of additional classrooms. In the 1970’s, the art and music rooms and another classroom wing were added to the original structure. Renovation of the office and clinic area was completed during the 1994 – 1995 school year. Over two million dollars was spent during the 1999 – 2000 school year to build a 16 classroom portable replacement building at UPES. The community of Union Park continues to grow rapidly and is now considered suburban. The growth pattern prompted the school system to consider more efficient ways of housing the increasing student population. Two new elementary schools, Riverdale and Lawton Chiles, opened in 1998 to reduce the student population at Union Park. Union Park Elementary School will offers exceptional education services on campus for students in the speech and language impaired programs, the specific learning disabilities (SLD) program, the gifted program, and the varying exceptionalities (VE) program. Each year we added an additional grade level. Student are Spanish and English speakers who learn together in both languages, ultimately leaving us at the end of 5th grade completely bi-literate in both languages. Union Park Elementary was made a magnet school during the 2011-2012 school year.